Test kits shown below are just a sample of the huge number of kits available. If you don't see it listed below, use the Order by Part Number tool at the bottom. NOTE: Additional Hazardous Materials carrier handling surcharges may apply for products on this page. You will be contacted by Internet Sales to confirm after the order is placed. Reagents are not available on all kits. Please consult Flow Engineering to confirm availability. 참고: Kit contents vary. 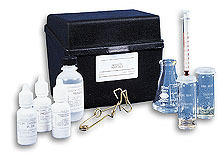 Each kit comes complete with everything necessary to perform the specified test.